Deciding to buy a good used car rather than a new one can be a smart, money-saving move. Finding the best car insurance for used cars is a wise second step. We looked at lists of the best used cars available for less than $10,000 and chose five popular options. Then we analyzed car insurance quotes for each. The verdict? There are no losers here. We looked at quotes from the largest insurers in California, Florida and New York for the minimum required coverage in each state. We didn’t include collision and comprehensive protection, which cover theft and damage to your own car. These coverage options usually aren’t a good buy for older cars because the amount you pay for two or three years’ worth of coverage could approach or exceed the maximum payout you would receive, considering the diminishing value of these older used vehicles. Coverage costs for these five vehicles were very similar. Quoted rates were much lower in California than in Florida or New York, partly because New York has higher minimum liability limits and Florida requires all drivers to buy personal injury protection. Methodology: Quotes are for 30-year-old men and women driving 10,000 miles a year, with state-minimum coverage: In California, liability for $15,000 in injuries per person and $30,000 in per accident, plus $5,000 in property damage; in Florida, liability for $10,000 in injuries per person and $20,000 per accident, and $10,000 in property damage, plus $10,000 in personal injury protection; in New York, liability for $25,000 in injuries per person and $50,000 per accident, plus $10,000 in property damage. Your rates will be different. Next, we compared average rates for the five cars from three large insurers that provided quotes in all three states. Allstate had the highest quotes of the companies when averaged across all of the states, although it had the lowest rates of the three in California. While State Farm has the lowest quotes of the three, on average, it wasn’t cheapest when other companies were factored in. USAA was cheapest overall in California and Florida, averaging $322 and $405, respectively; however, it is open only to current and former military members and their families. Excluding USAA, 21st Century was cheapest in California ($424 on average) and State Farm was cheapest in Florida ($707). Geico was cheapest in New York, at $648, although we didn’t get rates from USAA in that state. Now that you’ve got an idea of the insurance costs, you can consider more details to help you choose the right vehicle. We’ve included an estimated retail price and average annual insurance cost for each vehicle. If you want a basic car for getting around town, it’s hard to beat the Honda Civic. “Think reliability, gas mileage, mechanical simplicity and a surprisingly long list of features, assuming you stay away from the base-level DX,” Autotrader wrote in praising the 2001-05 Honda Civic models. 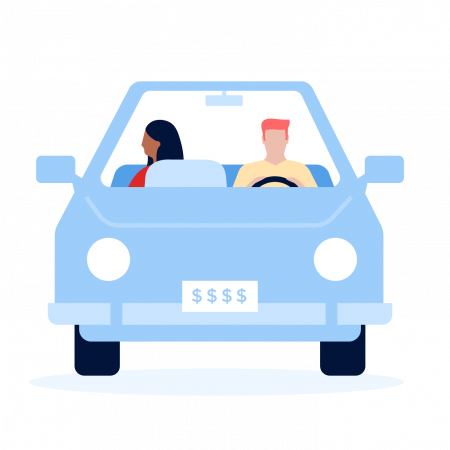 No matter which cheap used car suits you best, you can search for the best insurance deal with NerdWallet’s comparison tool.